This graph presents the results of an annual survey among a representative group of video game users regarding their age. 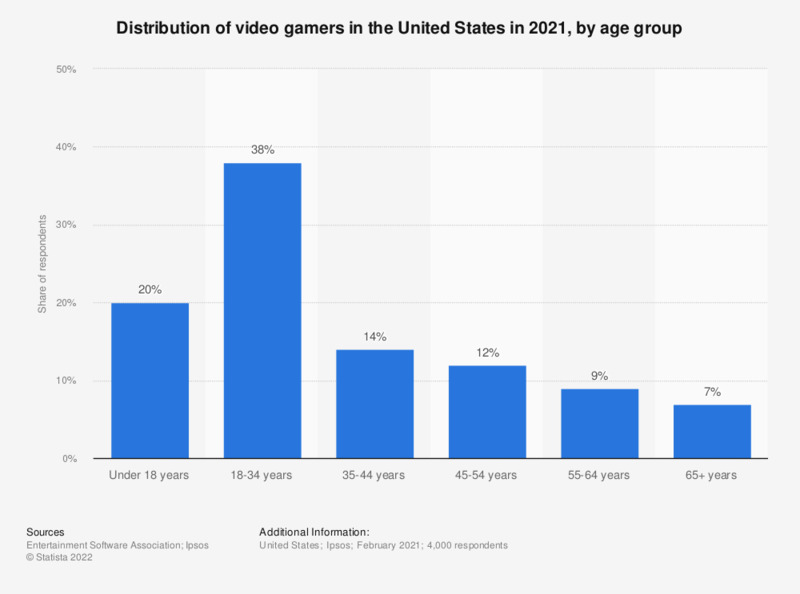 In 2018, 29 percent of the responding video gamers were 18 to 35 years old. Studies conducted in 2015 point out that more than half of the U.S. population have never played a video game. While the majority of gamers tend to be male, gamer gender proportions have fluctuated over the last decade. In 2014, there was an almost equal split, with 52 percent of men and 48 percent of women having played video games that year. However, 2017 data suggests that male gamers outnumber female gamers once more. As the age breakdown of video game players in the United States reveals, younger people were more likely to have played video games at least once in their life, with 67 percent of Americans aged between 18 and 29 years admitting to having done so, followed by 58 percent of Americans within the 30 to 49 age bracket. Looking at sales data, we can observe the development of the video game market and changes to consumer format preferences. In a period of seven years, the decline in physical video game sales was accompanied by a growth in the share of the digital format. In 2009, 80 percent of video games sold were physical copies and 20 percent were digital ones. By 2016, the split was in favor of digital distribution. Additionally, U.S. gamers were found to prefer making their game purchases online. In fact, 53 percent of American gamers listed online retailers as one of the leading locations for their games purchases, while only 21 percent listed the brick and mortar store, Gamestop. The 2018 figure calculated based on provided distribution data. Figures exceed 100 percent most probably die to rounding.